SAN DIEGO—For most of its 50-year existence, the La Jolla Music Society (LJMS) has had as its principal performing venue the Sherwood Auditorium, a 492-seat space owned by the Museum of Contemporary Art San Diego. By common consent, the Sherwood was nothing special, but it was good enough to allow the LJMS and its three-week August festival of chamber music, SummerFest, to prosper. From time to time there was talk of a new hall, but the idea never gained traction until the museum decided several years ago to demolish the Sherwood. Suddenly faced with a challenge, LJMS embarked on a serious fund-raising campaign, the result of which is the Conrad Prebys Performing Arts Center, which opened auspiciously as the Society’s new home with a gala weekend, April 5-7. Named for the late Conrad Prebys, a prominent San Diego property developer and passionate music lover, the 49,200 square-foot facility, known as the Conrad, consists of the 513-seat Baker-Baum Concert Hall, a smaller “blackbox” performance space called the JAI, and an open-air courtyard connecting the two. Designed by Boston-based Epstein Joslin Architects (responsible for Seiji Ozawa Hall at Tanglewood) and Tokyo-based Nagata Acoustics, headed by Yasuhisa Toyota (Walt Disney Hall, the Elbphilharmonie), the Conrad has considerable appeal to both eye and ear. The latter was apparent from the first selection on April 5, a performance by Hillary Hahn of the vibrant Prelude from Bach’s E-major Partita. It was a bold choice to entrust first acoustical impressions to a solo violin, but Hahn’s brilliant performance said all you needed to know. Her plush tone filled the room sensuously, while each note emerged distinctly. Other performances confirmed the favorable impression: single movements from Brahms’s G-minor Piano Quartet and Mendelssohn’s Octet, as well as Chopin and Liszt eloquently played by pianist Jean-Yves Thibaudet. Nonstandard fare included selections for ukulele played by Jake Shimabukuro (though I could have done with fewer than three) and performances by Lil Buck, a master of the street-dance style called jookin. For an encore the assembled performers were joined by youngsters from the LJMS after-school program for a touching rendition of Somewhere Over the Rainbow. Following the concert, violist Heiichiro Ohyama, founding Artistic Director of SummerFest and among the performers, pronounced the hall’s sound as having richness and liveliness without excessive reverberation. The Conrad is located on a normal commercial block, with no prospect for a plaza or other surrounding open space. 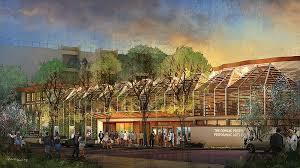 Accordingly, the decision was made to incorporate open space within the structure itself, hence the courtyard, which invitingly connects the two venues. Another issue was posed by the city’s 30-foot restriction on building heights, which resulted in the installation of technical equipment underground. Details indicate the Conrad was inspired by elements of La Jolla’s architectural heritage. Terra cotta slats sheltering the balconies, for example, were modeled after wooden slats that let in air and light at the famous Balboa Park Botanical Building. 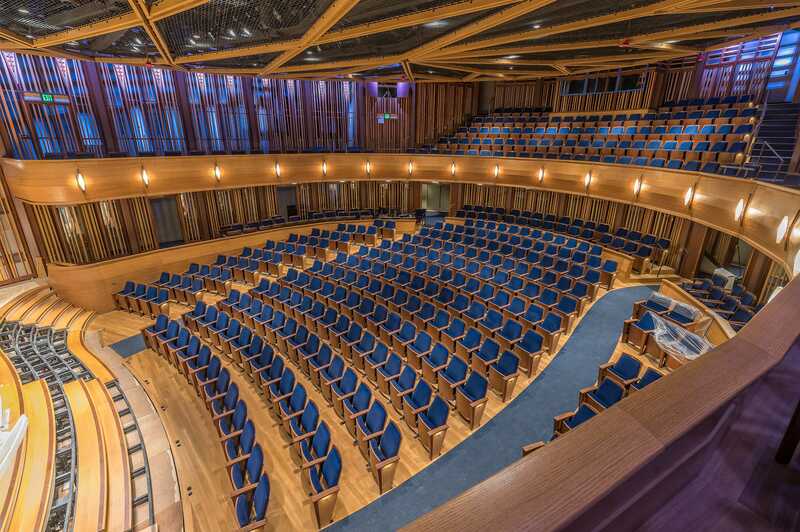 According to architect Alan Joslin, the Baker-Baum Concert Hall’s most distinctive feature is its combination of a shoebox shape, the layout now widely preferred acoustically, and a horseshoe seating arrangement that brings spectators closer to the performers and enhances their sense of involvement. The reconciliation of these diverse shapes was accomplished by situating the horseshoe arrangement within a concrete enclosure forming the shoebox. Bordering the horseshoe is an acoustically transparent wooden grill that allows sound to circulate within the shoebox. Wood is indeed the favored material of the Hall’s interior, including the stage floor, which is made of Alaskan yellow cedar, a hallmark of Toyota halls. Like many halls, Baker-Baum allows for acoustical adjustments. For the April 6 concert by the British pop singer Seal (which, of course, was amplified), heavy curtains helped to cushion the sound, but it was still pretty loud for my classical-accustomed ears. Acoustical niceties are less important at the JAI, by its nature; it hosted the jazz band The Hot Sardines on April 7. LJMS’s announcement of the programming for this year’s SummerFest, which runs from August 2 to August 23, gives an idea of what the new leadership has is in mind. Fittingly, given the new facility, Barnatan has chosen an over-arching theme of “transformations.” The opening concert, called The Time Traveler’s Suite, juxtaposes compositions from multiple musical eras, including a world premiere by Conrad Tao. Three Synergy concerts exploring connections between music, art, and dance will include Mussorgsky’s Pictures at an Exhibition with visuals by Doug Fitch (August 15), and the premiere of a new work by the Mark Morris Dance Group (Aug. 21-22). Composer-in-residence David Lang will curate two concerts of new music (Aug. 11 and 18), and Brett Dean’s Seven Signals, a Music Society co-commission, will be heard in its West Coast premiere (Aug. 14). Several familiar works, including Mahler’s Fourth Symphony, with soprano Susanna Philips (Aug. 3), and the Prelude to Wagner’s Tristan und Isolde (Aug. 20) will be heard in chamber versions. Three concerts of Beethoven quartets, each performed by a different string quartet—the Brentano Quartet (Aug. 9), Miró Quartet (Aug. 10), and the Ehnes Quartet (August 16)—promise to be an engaging jumpstart of the forthcoming Beethoven year.